Not only does C. Baron Photography offer Wedding, Event and Lifestyle photography, we also offer a number of other services to complement our Collections! Red Carpet Service – HUGELY popular new service – as your guests walk into your event, they are greeted with a red carpet with a step-and-repeat backdrop – paparazzi take their photo and they receive the print with your personalized logo within 30 seconds! Online gallery and image files included. Perfect for corporate events, movie-themed parties, sophisticated events – even the Easter Bunny and Santa Claus! Swanky Photobooth – A large tuxedo photobooth, complete with chandelier. Props, of course!. Upgrades include a scrapbook/guestbook for the client. 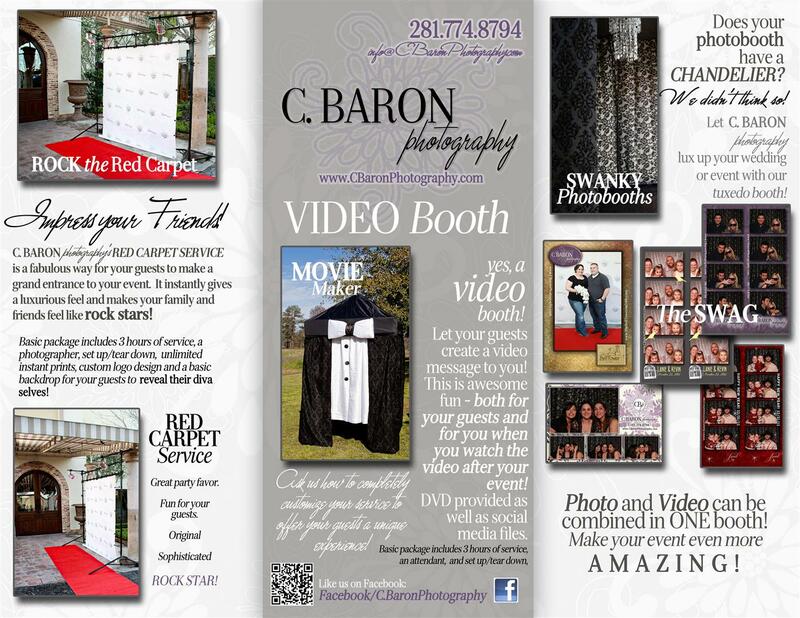 Different print layouts available – all customized for your event. Online gallery and image files included. Open Photobooth – see above, just out in the open for everyone to enjoy! VIDEO BOOTH! – A very new product – set up like a cloth photobooth – allows your guests to go in and record a 10 second video to the happy couple! Client receives a DVD of all the videos, edited together. PHOTO/VIDEO BOOTH Combo – another new product – we have the ability to allow your guests to choose if they would like a print AND leave the happy couple a video message! Instant Slideshow – One roving photographer taking candids that are displayed by projector onto a blank wall during your reception, in real time!!!!!! Custom designed invitations and other press products – products that are one of a kind, custom-designed to the very last pixel to suit your tastes and your wedding design. The design can then be carried throughout the wedding, tying everything together! Beautiful Layflat/Flushmount albums – we offer all styles of albums with design, starting with a layflat book up to Italian made flushmount layflat albums.